The loss of an animal is always discouraging, but it may provide an opportunity to gain valuable insight. Ultimately, this may help prevent future losses. Post-mortem examination is extremely valuable because it provides an opportunity to examine everything, both inside and outside. The loss of an animal is always discouraging, but it may provide an opportunity to gain valuable insight. Ultimately, this may help prevent future losses. A post-mortem examination is extremely valuable because it provides an opportunity to examine everything, both inside and outside. It is carried out on a dead animal to find out the reason of animal death, It is only worth doing a post-mortem examination if the animal is freshly dead. After death, changes take place quite quickly and it’s become difficult to find any abnormalities before death. Postmortem is also carried out on the carcasses used for human food. 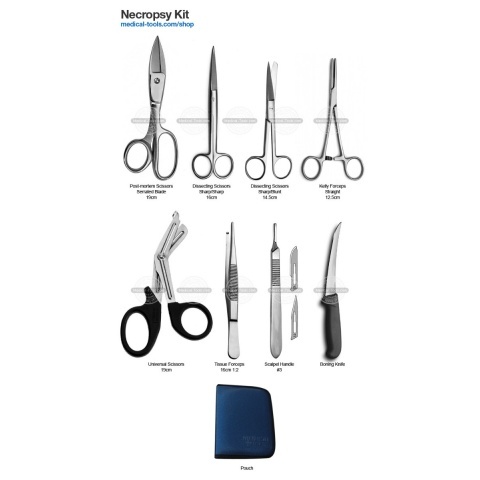 Our postmortem kit contains all the necessary tools to perform a complete postmortem. All Tools are made from Surgical Grade stainless steel and used by professionals. The kit is designed for both Small and Large Animals.